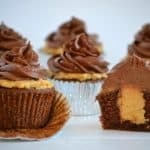 Double Chocolate Peanut Butter Filled Cupcakes – moist chocolate cupcakes with milk chocolate chips, filled with a peanut butter cream and topped with chocolate buttercream. 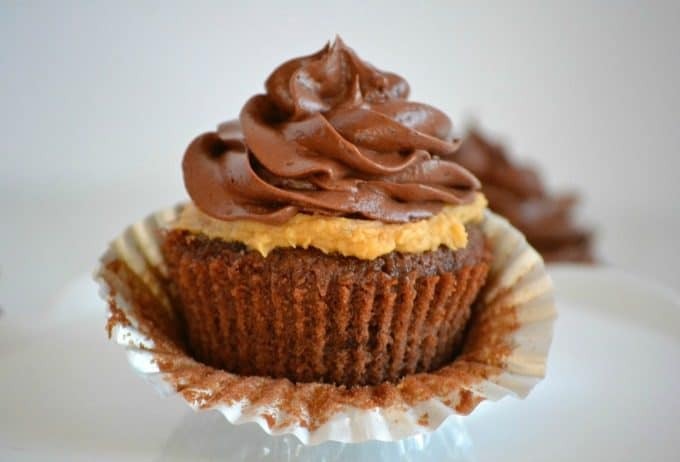 This cupcake is sure to please any chocolate and peanut butter lover. With these cupcakes, I feel like the blog is almost complete. I hope I didn’t scare you when I said, “complete”. By no means am I giving up my day job and discontinuing this blog. I meant that up until this point, I haven’t put a simple chocolate chip cookie, brownie or cupcake on this blog that I’ve really absolutely fallen in love with – one that I can honestly say is my go-to. 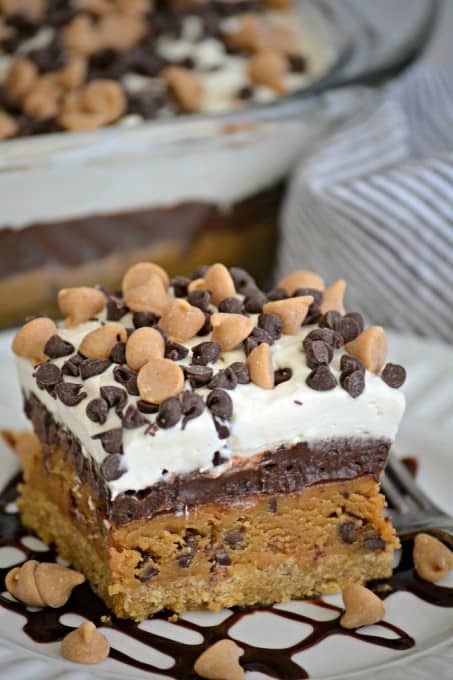 We all know that chocolate and peanut butter are like a match made in heaven, right? 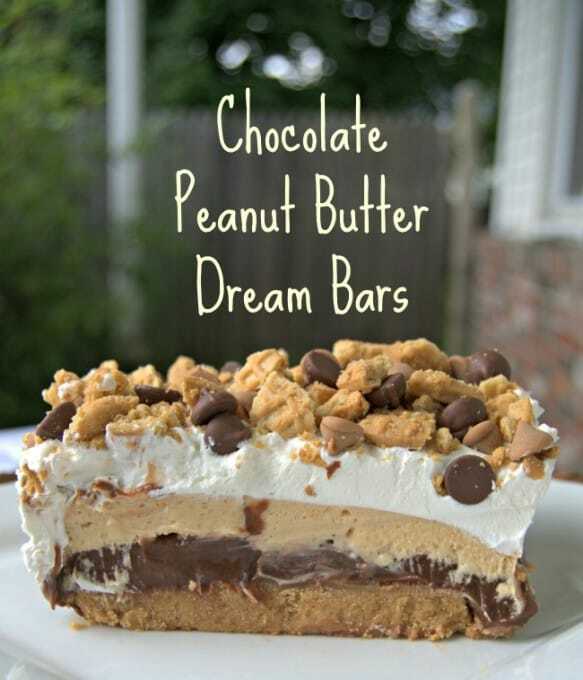 By far, THE most popular recipe here on the 365 Days of Baking and More blog are my Chocolate Peanut Butter Dream Bars. If you like chocolate and peanut butter, these have your name written ALL. Over. Them. But now, we have these cupcakes. It’s funny how they started because I was just going to make a simple chocolate cupcake with some buttermilk that I had to use up in the fridge. Going through my cookbooks, I found a recipe for Chocolate-Orange Cupcakes in my Williams Sonoma Baking Book that I played with and it morphed into something that tastes so darn delicious, that I myself was even surprised. My oldest daughter took one bite and before she even swallowed she said, “Mmmhhmpf.” I’ll take that as a big thumbs up. When I went on Facebook LIVE yesterday to share what I was doing with the cupcakes, I had a lot of people ask what I was using to make the hole in the cupcakes. It’s just my simple OXO Apple Corer. 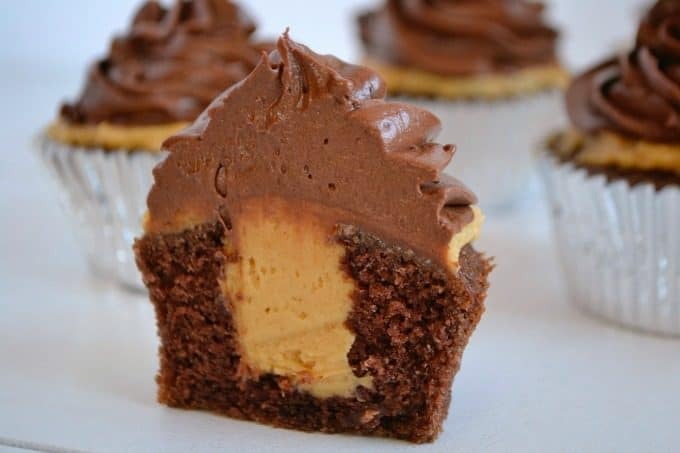 The handle has a good grip and when inserted into the cupcake, takes out just the right amount to allow for enough filling and the layer of peanut butter filling to cover the top as well. OXO also has a cupcake corer, but it looks like it might be a little wider than the corer I used, so not sure if you’d be able to have the additional layer on top. If you’re in a hurry to make these cupcakes, you’ll probably be able to find these items or ones like them at your local Walmart, Target or Bed, Bath & Beyond. To frost the cupcakes, originally I was using the Wilton #21 Open Star tip, but then changed to the Wilton #1M tip because I wasn’t satisfied with the thickness. Remember to purchase the decorating bags and couplers to hold the tips, too! Join me and my friends in the 365 Days of Baking and More Facebook group where we’ll share recipes, tips and enjoy virtual milk and cookies! AND, I’m LIVE on the 365 Days of Baking Facebook page Mondays, Tuesdays and Fridays, so be sure to watch me make a recipe from my kitchen and share weekly kitchen tips. I’d love for you to join us! 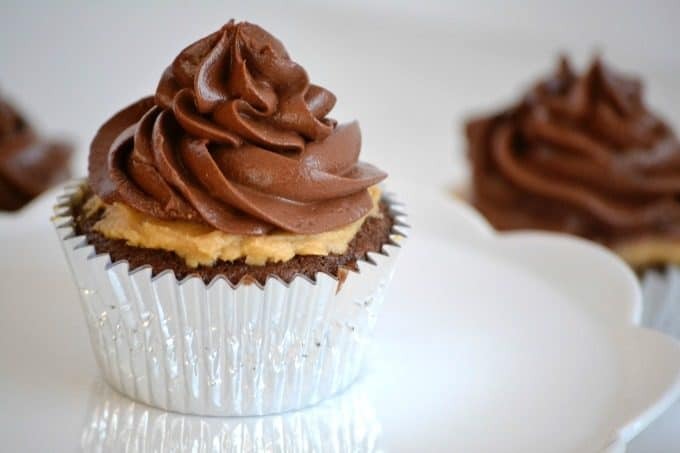 Double Chocolate Peanut Butter Filled Cupcakes - moist chocolate cupcakes with milk chocolate chips, filled with a peanut butter cream and topped with a chocolate buttercream. 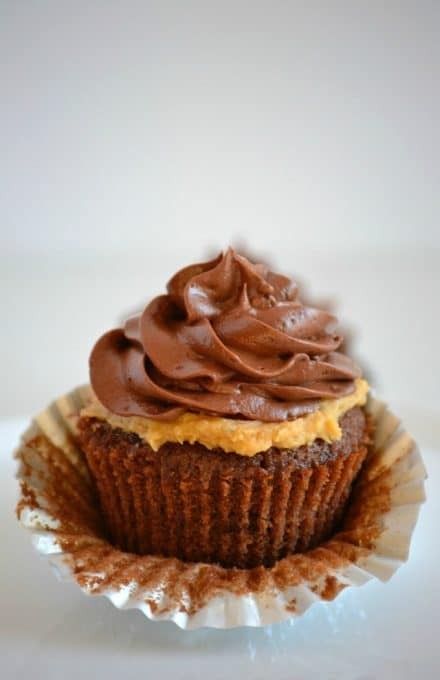 This cupcake is sure to please any chocolate and peanut butter lover. 1/4 cup heavy cream added a tablespoon at a time. Preheat the oven to 350 degrees F. and prepare a 12-cup muffin tin by lining it with cupcake liners. In a measuring cup, mix together the coffee and unsweetened cocoa. Into a medium bowl, sift together the flour, baking powder, baking soda and salt. In a mixing bowl, cream the butter and sugar together until light and fluffy, about 4 minutes. Add the eggs, one at a time until well incorporated. Mix in the vanilla and coffee. Add half of the flour mixture and combine. Add half of the buttermilk and combine. Scrape down the sides and bottom of the bowl. Add remainder of flour and remaining buttermilk and thoroughly incorporate. With a rubber spatula, fold in the milk chocolate chips. Spoon into cupcake liners and fill 1/2 to 2/3 full. Bake for 15 - 20 minutes or until a cake tester or toothpick inserted into the middle of each comes out clean. Allow to cool completely on a wire rack before filling and frosting. In mixing bowl, cream together the cream cheese and peanut butter. Mix in the confectioners' sugar. Add the heavy cream, one tablespoon at a time and mix until smooth and creamy, scraping the sides of the bowl. Cream the shortening and butter together in the mixing bowl until well combined. Add half of the confectioners' sugar and combine well. Thoroughly mix in remaining confectioner's sugar. Add 4 tablespoons of milk and beat at medium speed until light and fluffy. Add remaining tablespoons of milk, ONE AT A TIME until desired consistency is reached. If you find that the frosting is still too dry add more milk by teaspoons, not tablespoons at a time. If too moist add more confectioners' sugar by one tablespoon at a time. Insert an apple corer or cupcake corer into the middle of each cupcake and remove. 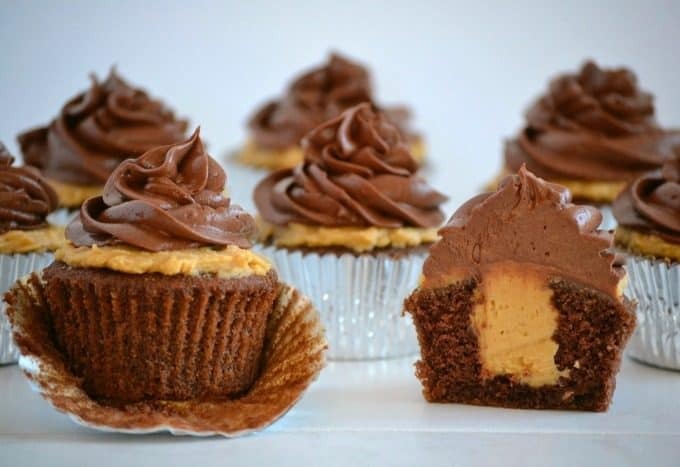 Pipe enough peanut butter filling into each hole to fill and spread a layer of the filling on the top of each cupcake as well. Using the Wilton 1M Open Star decorating tip, frost each cupcake with the chocolate buttercream. If you find that the frosting is too soft, refrigerate for 15 - 20 minutes before using. And make sure you’re following my ! !All Things Chocolate AND Peanut Butter!! 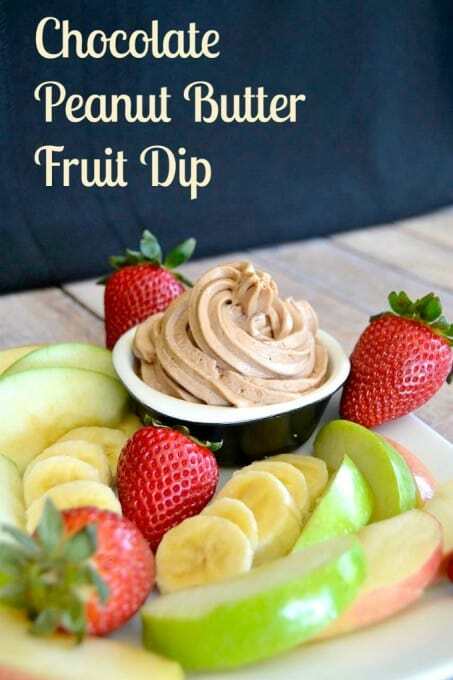 Board on Pinterest to find more delicious recipes! This is the best looking cupcake I have ever seen! Yum! Marina, thank you so much! They were pretty darn delicious. You could always freeze some and pull them out for a quick treat or for company. Hi – these look amazing. Just wondering if I can use regular AP flour or does it have to be unbleached? Thank you, Lauren. You can definitely use regular AP flour! The only flour I buy is unbleached so that is why I named that one. Since no one in house drinks coffee n the coffee be substituted with something else? So, I am assuming this makes the 12 cupcakes? I am wondering if the recipe works if I doubled it? Have you ever done this? Or even tried to do the recipe and then half of another. I am making them today and know that we will definitely want more than 12!!!! Thank you. The cupcakes look amazing. Crystal, the recipe says it makes 18 cupcakes. Hopefully that will work for you. Enjoy them! I don’t want to make it with coffee. How will that effect the texture? Jackie, leaving the coffee out won’t change the texture, it will just alter the taste slightly. You could substitute water for the coffee and you should be ok as it’s only 1/4 cup. LYNN JUST TRY THE COFFEE ONE TIME, YOU WILL NEVER MAKE MUFFINS OR A CHOCOLATE CAKE AGAIN WITHOUT ADDING COFFEE….I DRINK INSTANT COFFEE, SO I JUST MAKE UP A CUP OF THAT….OR SOME JUST WILL BUY A CUP AT MCDONALDS…FOR $1.00….IT JUST MAKES THE CHOCOLATE TASTE RICHER…..I LOVE IT AND DOES NOT HAVE COFFEE TASTE….JUST ENRICHES THE TASTE….. Looking forward to making these for a party! For the frosting, (4-6 tablespoons of milk) do you recommend whole milk? Thanks! Thanks, Liz and yes, I used whole milk. This really is a wonderful recipeto start with. But taste as you go and make adjustments as necessary. I changed it a little and made it vegan (applesauce for eggs, vegan cream cheese, soymilk with a little lemon juice for buttermilk). I thought the PB icing wasn’t peanut buttery enough so I added extra. Same for the chocolate icing…I added extra cocoa. I don’t like coffee so I used milk instead. I think I used Ghirardelli dark chocolate chips. I made these for my daughter’s first birthday. I got super reviews. Everyone loved them. I was glad because it took quite a while to make them. I will do it again! Thanks for posting! I don’t like coffee.. What can I use to replace the coffee in the batter recipe? Sorry Lynne! Just saw you already answered this question! Thanks! Excited to try these cupcakes! These look so delicious. My son birthday is tomorrow afternoon, Saturday at 3. It Friday at 3 now and I made the cup cakes. When should I do the filling and frosting for best results? Happy Birthday to your son, Emily! I hope he enjoys the cupcakes. My suggesting would be to fill and frost them in the morning and then refrigerate them before the party so they’re well set. Then remove them about a half an hour before serving and you’ll be good to go. Have a great party and thank you for selecting this recipe!